15-year old John, having just left the Penn household in Ruscombe, England, writes home. He mentions his mother’s cooking and the well-documented family love of chocolate. 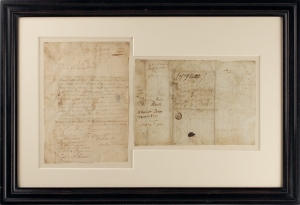 The recipient, John’s younger brother, Thomas Penn, who later owned ¾ of William Penn’s proprietary interest in Pennsylvania, practices signing his name on the address leaf. The “Black Cap” referred to in John’s postscript is a reference to the famous Quaker hat. Quakers, as a sign of their egalitarianism, refused to take their hat off for anyone, regardless of societal rank. “Addam” was William Penn’s nickname, a reference to the biblical first man. JOHN PENN. Autograph Letter Signed. Bristoll, 4 Decem: 1715. 1 page, with autograph address and six examples of Thomas Penn’s signature on verso. [on margins in Thomas Penn’s hand:] his own name, signed in six different fashions, at the age of thirteen. This marks the earliest known written exchange between two sons of William Penn and Hannah Callowhill, John and Thomas. At this point, John was fifteen years old and Thomas thirteen. Their father, the founder of Pennsylvania, was largely incapacitated after suffering two strokes in 1712. The Penns split their time between the Callowhill estate in Bristol, where Thomas was born, and Ruscombe, a manor house rented by William Penn. At Ruscombe lived William and Hannah, their children John, Richard, Dennis, and Thomas, and William’s children from his first marriage. The struggle between Hannah Penn and her sons, and William Penn, Jr., for control of Penn’s estate lay in the future. 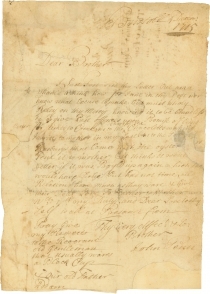 John Penn had just begun to live with the Callowhills in Bristol in order to apprentice as a merchant, and Hannah encouraged him to write to his younger brother. John Penn (1700-1746), William Penn’s son, called “the American” because he was born in Philadelphia, though he remained for less than a year. In the complicated settlement of his father’s will, John received half of the proprietorship of Pennsylvania. John went back to Pennsylvania in 1734, attending a few meetings of the provincial council before returning to England a year later. He died with no heirs, and left his rights in Pennsylvania to his brother Thomas. Thomas Penn (1702-1775), proprietor of Pennsylvania. In 1718 his father died, leaving the proprietary interest in Pennsylvania to his widow as executrix for their four sons. This was contested until 1727, after she and the youngest son, Dennis, had died, at which point the eldest son, John, received half the proprietary, and Thomas and Richard each one-quarter. Thomas spent most of his adulthood in London but directed his proprietary interest in Pennsylvania carefully. His greatest influence was in appointments and in the survey and sale of lands – he is known for his role in the infamous “Walking Purchase” of 1737, whereby the Delaware Indians were forced to agree to a fraudulent land deal surrendering much of their homeland along the upper Delaware River. Penn was an important but polarizing figure in Pennsylvania affairs – Benjamin Franklin organized the Quaker Party in opposition and sought to have the King declare Pennsylvania a royal colony. One major sticking point was Penn’s unwillingness to allow the colonial assembly to tax family lands. With minor loss, and tissue encapsulated, but very displayable and fine overall.